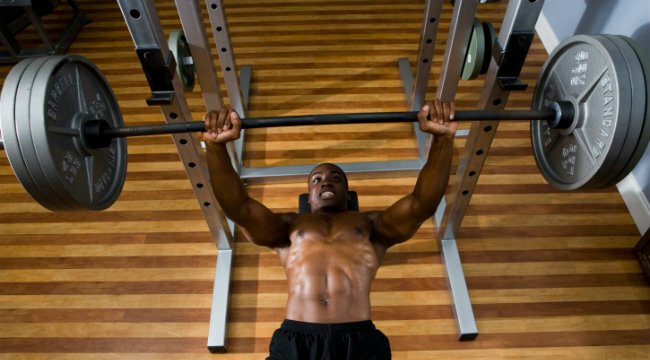 Build the biggest hood in the hood with these old-school, pec-pounding approaches. Behind bars, a well-developed chest is called a “hood” and that equals status. Let’s take a look at some ignored strategies that can help you build the biggest hood in your ‘hood. Personal feelings about the direction professional bodybuilding physiques are headed aside, it is fair to say that in no other bodybuilding era has the muscular development come close to the current crop that grace the Olympia Stage. 20+ inch arms, freakish leg development and broad shoulders are no longer anomalies, they are necessities. Pundits often point out, in dismay, the distended bellies that seem to go unpunished by judges on the pro circuit. Surprisingly, poor pectoral development seems to escape the same type of criticism. Let’s take a stroll back to the “Golden Age” of bodybuilding and whether it be Arnold, Franco, Lou, Reg Park or Chuck Sipes—they all had magnificent chest development. Even at 40 pounds lighter, the aforementioned Golden Era bodybuilding demigods would have wiped the majority of modern-day IFBB pros clean off the stage, with a few exceptions. Let’s borrow some ideas from our classic counter parts and look at some new research to build the biggest hood in the ‘hood, by taking the following four steps. Reg Park was one of the first men to bench press 500 pounds, Chuck Sipes was close to a world-record bench press, and Arnold started off as a powerlifter. All of the aforementioned men bench pressed heavy; their chest development reflected this. Nearly every old-timer with great chest development performed barbell or dumbbell pullovers. Not only does this exercise work the chest but even the lats and intercostals. Maximally-developed intercostals give the illusion of a bigger rib cage when taking a breath and holding pose. Recent research has confirmed that cable and machine pullovers are more effective for targeting the lats while barbells and dumbbells are for targeting the chest. Barbell or dumbbell pullovers are a necessity to truly maximize the illusion of a huge chest. IFBB Pro Cory Mathews performing dumbbell pullovers. A recent Canadian study showed the reserve grip bench press elicited 30 percent greater upper chest activation than the traditional bench press. Furthermore, this lift is much easier on the shoulders, for many lifters, than traditional bench presses. Dumbbell flyes are awesome because of the great stretch overload at the bottom of the movement; the drawback is as you bring your arms together, the overload disappears, it becomes easy. Chain flyes allow you to overload the entire range of motion; as your leverage improves, link by link, the chain comes off the ground. You cannot take it easy and coast to the finish—maximum effort is required through the full range of motion, producing maximum overload, which equals maximum growth. Big Al Davis performing chain flyes. A well-developed hood is a status symbol in both strength and aesthetic circles. Give these four strategies a shot and watch your pectoral development reach new levels in the New Year.